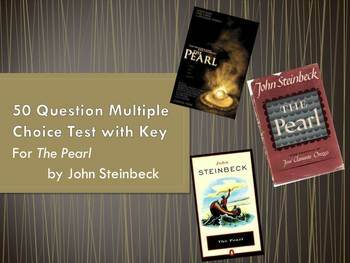 Fifty question, multiple choice test with answer key for The Pearl by John Steinbeck. This test includes novel excerpts and questions, recall, inference and vocabulary questions among others. This test can be used with a Scan-tron answer sheet. PLEASE SEE THE PREVIEW FOR A LOOK AT THE TEST. THIS ITEM IS INCLUDED IN MY COMPLETE TEACHING UNIT FOR THE PEARL.